Elias plopped himself down to a seat on the stylized glass pattern of a flower petal and dug around one of the inner pockets of his jacket. While he searched, Eral turned to view the city around them. For a being so small, everything around them outsized him, but from up there the houses looked miniature. Then, without more setup, Elias closed his eyes and started to play. It was a slow tune at first, like he was testing out the sound of the instrument he’d had for years. 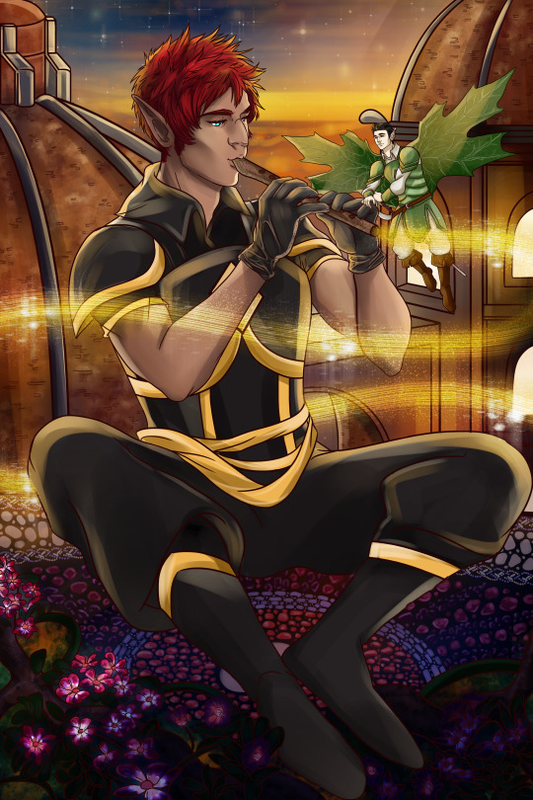 Eral drifted in the air near the wandering bard’s head while he played, admittedly captivated by the husky sound of the flute. Even he could tell when magic was weaving into the notes, slowly and carefully. Elias was about to work something huge from the top of that tower. Soooo I got a surprise from @nightmares06 for Christmas! A scene from my Song of Awakening drawn by @dtv-art and I love this so much @o@ I’m this close to gluing my face to the screen to keep staring at it oh my God. Thank you so much for this, and here it is for the whole world to see!